Social Media Marketing Blog by Jyoti: YouTube Ad - How to remove? YouTube Ad - How to remove? Annoyed by invideo adverts on Youtube™? Install Adblock for Youtube™ now and all the Pre-Roll Ads on Youtube™ are gone forever! Adblock removes any ad videos shown before your video. Youtube Adblock™ is build with latest Adblock filter technology. 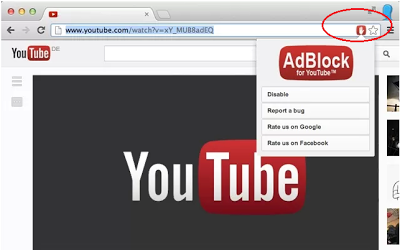 Once you add this extension to Google Chrome, you will see no advertisements! Try it. Let us know your feedback in the comment below. Hope you will Like this post and Share.